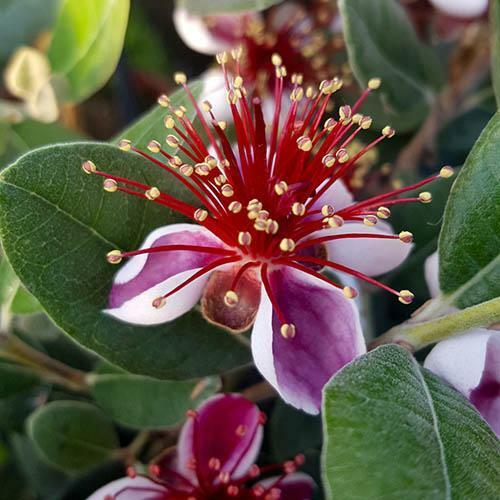 A fascinating and stunning looking plant, this Pineapple- Guava is a native of South America yet is perfectly happly here in the UK. Like a bird of paradise, its flamboyant sorbet pink and ice-white blooms will create an exotic display from late spring to early summer. .Bushes are evergreen giving year round interest, hardy down to at least -5C and when mature reach about 6 x 6ft. A fascinating and stunning looking plant, this Pineapple- Guava is a native of South America yet is perfectly happly here in the UK. Like a bird of paradise, its flamboyant sorbet pink and ice-white blooms will create an exotic display from late spring to early summer bearing sweet nectar that is loved by butterflies and bees. In autumn this stunning plant then yields delicious, tropical tasting green egg shaped fruits with succulent flesh - similar to a kiwi but smoother in appearance. Enjoy fresh or bake into pies and crumbles for a special treat. Bushes are evergreen giving year round interest, hardy down to at least -5C and when mature reach about 6 x 6ft. They're very easy to grow and are particularly suited to raising in a large pot or planter. Delivered as an established shrub in a 5L pot.